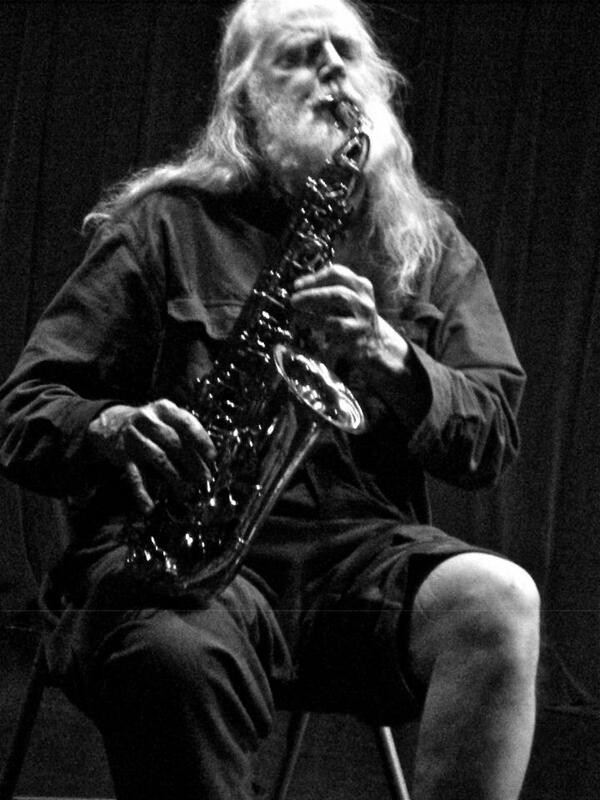 Jack Wright has been a free-improvising saxophonist for over 30 years, though he has been playing for much longer than that. His list of collaborators include bassists Evan Lipson and Ben Wright, percussionists Andrew Drury and Ben Bennett, multi-artist Bob Marsh, trumpet player Tom Djll, saxophonist Michel Doneda, electronicists Andrea Pensado and Walter Wright, pianist Denman Maroney, and vocalist Carol Genetti. Recently Jack answered a few questions from AMN. Special thanks to Dan Barbiero for his help with the questions. In your earlier days you played in an expressive, free jazz vein, though now you no longer do. What motivated the change? Part of that change was to create a wider breadth of sounds with the horn. What drew you to explore such an extended vocabulary of sound? Towards the end of the 80s I began to feel my playing had become stagnant and repetitious, around the same time that “free jazz” was being resurrected as a codified expressiveness out of sixties materials. I was disillusioned with my playing even as I continued in much the same vein as before, while returning to my core practice of random pitch relations. Towards the end of the 90s, however, I was attracted to the playing of saxophonist Bhob Rainey, almost diametrically opposite to my own. On a long tour with him in 2000 I began working with slow, sustained textures at a quiet level, where precision was crucial, rather than my usual blur of expressive release. 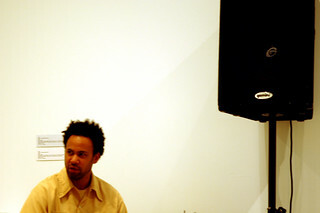 Deliberate stopping and long pauses were possible, rather than continuous blowing, thus a kind of tension and space unknown to the free jazz formula. Playing could be a conscious act, closer to composition than I had ever gone, with the narrow parameters of a “piece” of art music. I went to Berlin in 2002 to play with those at the center of this kind of playing, called reductionism or in the states “lower case.” I felt inadequate at this, a beginner and a bull in a china shop, restraining my preference for physicality and explosiveness, which survived underground. Then two tours in 2004 got me to Paris, where reduced playing was being explored in a more open, less pretentious atmosphere than Berlin. In both cities, and in London, I found new partners in this direction and organized tours with them in Europe and the US. I wasn’t interested in joining the reductionist scene but in learning a new and more aware kind of playing, shaping music rather than just letting it happen. I wanted to abandon the usual dominant position of the saxophone, a hindrance to egalitarian group improvisation. The search yielded new techniques–bending the embouchure out of its normal position, muting the horn with plastic bottles, using “incorrect” fingerings for variable pitches and sound, and greater use of multiphonics. I began to play regularly with European and American electronics players, who pushed me further than ever in a textural direction. I also did several tours with French saxophonist Michel Doneda, a deep explorer of breath sounds (in trio with percussionist Tatsuya Nakatani). By no means reductionist, Michel plays with emotive force and body presence, when playing quietly or at higher volume. In general I found players far removed from any jazz influence yet on the expressive side of what is usually categorized as avantgarde (usually called “experimental”). Playing with them led to further discoveries, for instance muting with my bare thigh and leg, which allows for greater control and a wider range of sound and pitch, since it permits gradual shifting, from the tightest possible seal to fully open. My playing became more bold, as I could stop on a dime, go quiet and textural beneath the volume level of others, and emerge with a radical shift of direction, all the while testing the limits of continuity. For over fifteen years I was not satisfied with my playing, even when I started adapting avantgarde techniques and compositional restraint. Yet more and more I was bringing my physicality and emotional commitment to the surface, now with greater command of resources than before. I even reintroduced occasional lyricism and pitch relations, considered anathema to current conceptions of advanced music. Since the beginning of my playing I have imagined a continually expanding tradition of saxophone playing, not as avantgarde innovation (for the advance of art) but as if jazz had continued to be adventurous and never entered its classical phase of self-repetition. Whether this tradition of saxophonists is a fantasy or not I have included myself in it, a communal rather than self-aggrandizing relationship. And like the postwar jazz musicians I have no scorn for music driven by feeling and reveling in the sublime. However, such playing cannot be contained in the forms that have long become codified and boring. Free jazz players stop at a certain point that is unnecessary, for instance they take the identifiable tone of their instruments as essential. I would rather twist that machine out of its recognizable, nostalgic identity, yet utilizing only that instrument, no wires or modifications attached. I am a body-centered player, a traditionalist in my loyalty to the instrument and to continual instrumental study, but not to its codifications. In the 80s I had internalized the split between the sixties black and white avantgardes, historically at odds, as if I were the ring for their wrestling match. For various reasons Free Jazz had reached a dead end, yet I deeply imbibed its fierce spirit; meanwhile the white avantgarde was unafraid of any innovation, yet following John Cage scorned personal investment—keeping one’s hands clean. At this point I feel no longer divided, for I am playing a music of full openness to sound and discontinuities, yet on a deep feeling level, and of wider range than ever. Especially on tour I am communicating this well with partners and listeners–few in number, I have no wish or need to expand. My first record in 1982 was “Free Life, Singing,” and that is what I’m doing, my life’s dream of adventure. When improvising do you work from any kind of underlying or implicit sense of form or structure? Since I got into music in the late 70s I have been a free improviser, a music as free of pre-structures as possible, and the greatest musical challenge to the player. So the answer is no. This means that I don’t choose to play differently from one piece to another, they are simply different improvisations; nor do I limit playing to specific parameters, as did reductionism, and most experimental music. Every time I play every possibility is present. However, I am very much affected by the partners I play with, adapting to their mode of playing and volume, catching their spirit and sometimes imposing my own—a playful game. If I could be said to make music then I must have a sense of form, but it does not preexist the music, as “working from” it would imply. Every improvisation has rules we have to follow, we just don’t know what they are. As someone quipped, you can do anything you want, but not just anything. In a live performance, do the listeners’ expectations — or imagined expectations —play a role in the music you make? This is an interesting and unusual question. If you mean what listeners expect to hear, then no, since there is little reason or means for the musician to probe that. But if you mean what I think the audience reaction will be the answer is yes, and is probably universal for performers. If I were to perform a composition, even my own, audience reaction would be shared with the piece of music; with improvisation however, especially a solo, the entire burden of audience judgment is on the player. And if truly playing freely, the improviser does not know what he or she will do, and cannot rely on reputation or past experience to carry the day, so it is a very insecure position to be in. There is good reason to fear rejection for playing what one has not prepared in advance. Expectations are always more or less imagined, so the question is, first, in what situation does one feel most certain that the audience will react positively, and secondly, does one prefer that security. You normally have the most positive response when you play in an established art music venue, where you are validated in publicity and reputation, paid a fee (often in advance), and are not dependent on the door. The audience expects undiluted art music and you provide it. This is what musicians generally prefer, rather than situations where there is potential vocal dissent, disturbing conversations, walkouts, doubt about whether your playing is really music, and low pay if people are not enthusiastic. The work of the music world institutions is generally to create more secure situations for musicians and listeners, to make everyone think they’ve gotten their money’s worth. My preference however is for the more insecure situation, where not knowing what listeners will think or do equals and accentuates my not knowing what I will do. This is very possible touring in the US, where venues exclusively for experimental art music are few, and hardly anyone knows what “free improvisation” means. There are then people who don’t know what they are getting into, who might be there accidentally or are prone to walk out. They react to the music rather than taking it as a given, and this energizes the music. We are all in a mutual state of tension and potential failure, a situation of musical experience rather than musical consumption. There is a small dose of fear that either liberates in the direction of spontaneity or leads to caution—the player has the choice. Free improvisation is often called “edgy” but that is false advertising if there is no real edge for listeners or players to fall off of. The established art music venue provides not a truly live situation but one where players are boxed in by all the credentials they have received. They are paid to demonstrate their music rather than experience the situation and fully relate to it as an unknown that has somehow entered their life. The true home of free playing is not there but, as in the Uncle Remus story, in Br’er Rabbit’s briar patch. And lacking the credentials of a “name” musician in the serious art world, people respond to me more honestly, and not as if they are supposed to like it. In the past you were known for your radical politics. Do you find a synergy between those and your radical approach to music? My music is neither political nor radical, given the common meaning of these terms. It is neither effective in causing change nor do I play in hopes that it will do so. In the 80s I criss-crossed the country, playing everywhere and with anyone at all, and thought of my activity as an extension of my earlier political radicalism and organizing. I saw free improv as inherently critical of the social order, which includes career and the hope for media recognition. On the other hand, music and art didn’t interest the left unless it was tagged with an explicit verbal message, so free improv was outside the left, apolitical as far as the left was concerned (including anarchism, by the way). Today “free improvisation” is accepted as a genre of art music, with its European originators and a few contemporaries recognized as representatives. Increasingly it is finding a home in academic institutions, which are becoming the only source of funding and careers in North America. Faint claims to radicalism by institutions, including the “underground music” media, are common today as promotional verbiage but bogus. Radical art must be “transgressive” and “genre-breaking,” which is far from my intention. Nor is it innovative, which implies the intent to contribute something of value to society, to wake it out of complacency or some such good deed. I represent nothing, not even “my music.” I simply play what I enjoy playing, like any fool. I do this in a world more penetrated by capitalist exploitation and injustice that I ever imagined in my post-68’er despair. That darkness includes the majority of music world institutions, with which all musicians must deal as pawns, elevated to the title of entrepreneurs but spending more and more time hustling and less time playing. Those art musicians who advertise their radicality have somehow managed to overlook how capitalist relations and institutions establish and maintain their position. We’re all hustling if we want to play in front of others, and expected to keep quiet about it. The duo CD that you recently recorded with your son Ben was your first release as a leader in some time. What was it like to record with your family as opposed to other musicians? The concept of a “release as a leader” is a throwback to the old days, when you were honored by a record label asking you to create a number of pieces, then hired “sidemen” to play your compositions. Now that it costs almost nothing to produce a recording, and takes less time than the actual playing to get it online, the hierarchical formality is usually dispensed with. This is especially true of free playing, since there is no such division of labor in making music that lacks a composer. The vast majority of music that players hope will be heard by others is self-produced, and it finds only miniscule resonance outside a small circle. If a non-musician, commercial label is involved, with “real money” being risked, there is more reason to think that anonymous listeners will hear and judge it. In that case, today musicians play and record, agree on what they like, and send off a copy to a label in hopes that it will be accepted. That was the case with the Jan. 2014 release of “As If Anything Could Be The Same.” In winter 2013 Ben and I came up with something that astonished us both. There was an established label, Relative Pitch Records, that I thought might be interested and I submitted it. In the small world of obscure improvisation it is a major label, the first I’ve come across and been accepted by in my 35 years of playing. Despite my briar-patch underground preference, I sincerely want my playing to be available to anyone who will listen, including the aficionados who scan the commercial labels. Almost all these labels are as risk-free as possible, and so depend on established names to keep afloat, thinking there is no market for the unknowns like myself, Ben, and my other partners. The problem with the operation of the music world in general is not that it sets up a hierarchy based on judgment but that there is little if any judgment based on actually listening and responding to the music. For outsider musicians the problem is not that our music is judged negatively but that it doesn’t get judged at all. The hierarchy is determined by venues, publications, and label owners using factors far removed from the musical content, relying instead on its imagined audience or sales “drawing power.” This is circular reasoning, leading to the current stagnation–a stabilized hierarchy rather than one in flux. Musicians are forced to play their cards right in order to get their music out to those who, given the choice, might think, “Where has this music been hiding?” When hustling, trend-following, and self-promotion takes the foreground the music suffers. Choosing this recording with one of my sons (the other is a drummer, now inactive) is not really a family affair for me. I do so on the basis of Ben’s superior ability on his instrument, our compatibility—created through our twenty-year history of making music together, which admittedly has to do with our father-son relation. I play with virtually anyone, but I try to limit those I perform with to players who challenge me, who have the musical ideas to take me someplace I wouldn’t otherwise go. This particularly applies to something I would submit to a known label. For me recording is not to document “my music” but an experience where my ears, hands, embouchure, entire body, are fully receptive and in the presence of others—partners and listeners—equally open and judging. On hearing Ben one might be surprised that he has had little involvement in the music world, has never been interested in a music career, and lives in New Mexico, where there is a limited number of free players. Initially he came out of punk rock, though in his teenage years he was always hearing me practicing and playing free stuff. He is an “ear” player, trained and practiced on the instrument but not in jazz, although with no attitude about it. True, there is something deep about playing with my grown son, a continuity that recapitulates the full range of feeling and transformations of forty-six years. But if he were not my son, a Russian or a Czech, I’d be flying to Europe regularly to play with him. The drum set is a collection of instruments, assembled to let one percussionist do the work of several. In that way, every drummer is a multitasker. Though he may have bloomed late as a drummer, multitasking isn’t much of a problem for Chicago’s Mike Reed. He’s co-organizer of Chicago’s autumn Umbrella Festival (where local improvisers meet European peers), runs logistics for the summer’s Pitchfork Music Festival, and helps program the Labor Day weekend Chicago Jazz Festival. And he now has his own northwest-side venue, Constellation. He even finds time to play the drums, with a broad Midwestern beat and low-to-the-ground sound, using any part of the kit (deep toms included) to throw off accents. Taylor Deupree is a sound artist, graphic designer and photographer. He has founded the record label, 12k, in 1997 and since then, it has gained an international following by providing a platform for electronic musicians, composers and sound artists to experiment with conceptual music. Deupree approaches his sound work in the fashion of a minimalist, emphasizing a hybrid of natural sounds and technological meditation, with no hint of digital idolatry. His work, Thursdays, is included in the original version of the ICI exhibition With Hidden Noise and he will debut a new collaborative piece with Stephen Vitiello for a newly updated version of the show.